Both the TAC men and women had qualified for the league final, with the women taking a fine 2nd place and the men a very close 3rd place. 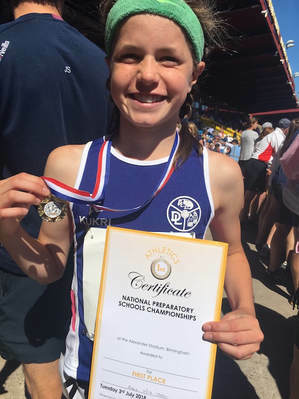 Maria Heslop is one of the few athletes who can be competitive at a younger age group, aswell as her own and she did this on Sunday. 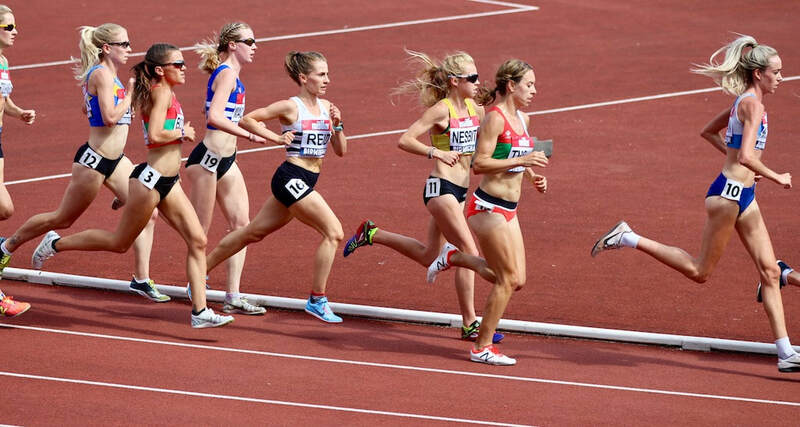 She comfortably won the over 50 women’s 3000 metres in 10.41.06 and also won the over 35’s 1500 m in 4.56.14. Before all of that she was second over 800m in 2.26.5, in the younger age group. Both her 800m and 1500m times were pbs. 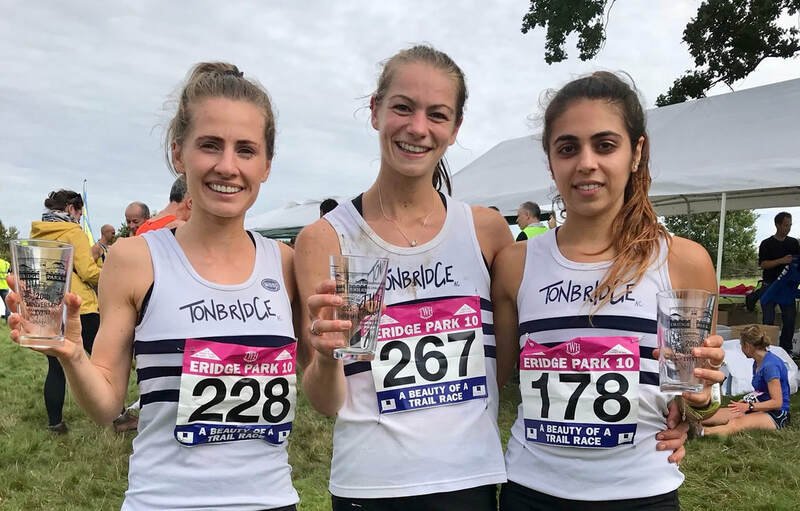 Adam Roeder won a "tactically brilliant" (according to coach Pete Mason) B string m35 800m, whilst Antonia Skerritt (w35, B string 800m) and Nichola Evans (w35, B string 1500m) did likewise. Claire Day won the B string w35, 3000m in 11.09.60, which was a big pb, by almost 12 seconds. Full results are on the Results 2018 page. 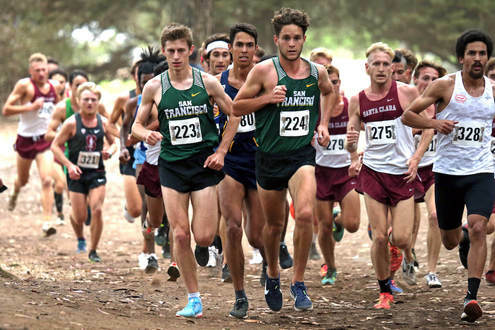 Chris Olley ran in one of the highest class cross country races in the USA on Friday. At nearing the halfway stage he had to stop and replace a shoe that was coming off and lost 10 to 15s, plus some momentum. Dropping to around 80th he clawed his way back to 38th at the finish, running 23.54 for the 8 kilometres. Anthony Bennett finished 8th in this 10 mile race in 60.48. This was his debut at the distance. Harry Lawson finished 2nd in 35.14, improving his time from 36.06 last year. Lucy Reid ran 5.11 for the JP Morgan team that won the mixed relay. It was the first win for a TAC female team at the championships since 1986. It was the third year in a row that TAC have finished 2nd. The B, C and D teams were first of their type. 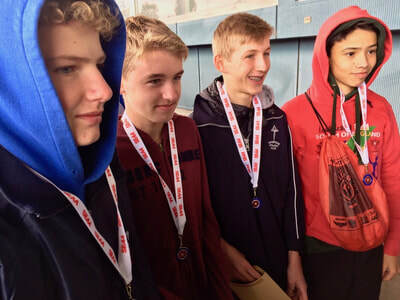 2nd Under 17 men (Fraser Gordon, Adam Van der Plas, James Kingston, Toby Emm). James Kingston was 6th fastest lap. TAC were also 2nd B team. Matthew Taylor was 6th fastest lap. 11th Under 17 Women and Katie Goodge ran the 2nd fastest lap. 11th Under 13 Boys. Albert Kreuzberg was 8th fastest lap. James Price won this road race in 35.31. Tracey Horne was First female in 44.22. 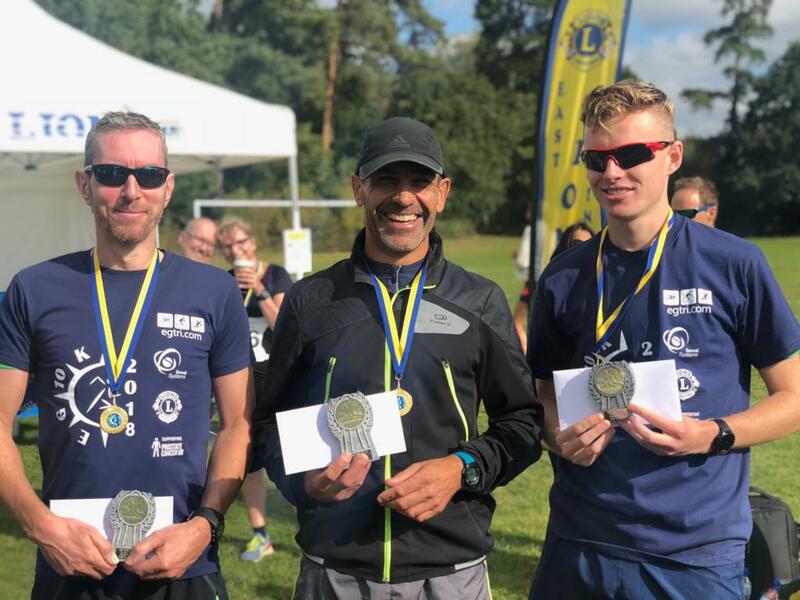 Joe Watts finished 3rd at the Hever Half Marathon Trail race. 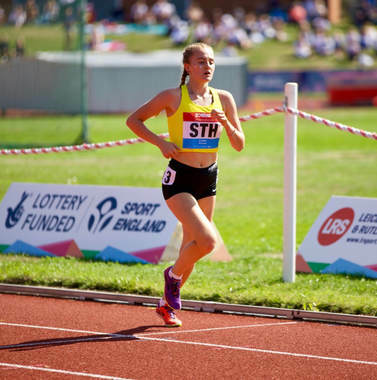 1200 metres - Lily Slack won the under 13 title in 3.54.44. James West finished 9th in a race that was a bit over 8km. ​Christian Smith won this road race by two minutes in 34.32. 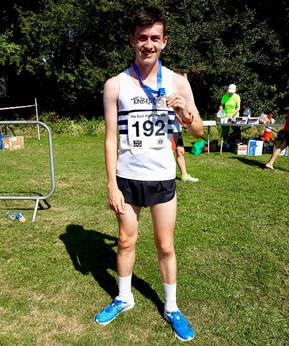 Christian is due to race in the South of England Road Relays next weekend for one of the TAC mens teams. I believe TAC had some teams in these relay championships, with the longer distance being over 3x800 metres. Am awaiting results. Lily Slack, Sophie Slack and Olivia Breed won the under 13 girls title in around 7.43. Albert Kreuzberg, Tim McLain and Ethan Rocks were second in the under 13 boys race. 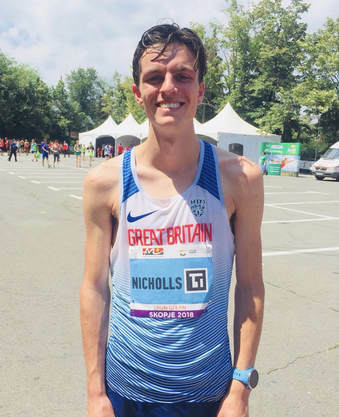 Max Nicholls finished 52nd in the World Mountain Running Championships, as he represented the Great Britain Men's team. Henry Pearce was not far outside his own TAC Half marathon record, when he won at Ipswich in 66.02. Dan Bradley finished third at Larkfield in 33.36, just twelve seconds behind the winner. Luke Hooper ran 36.31 in 19th overall to smash his pb by 2 minutes and 43 seconds. Maria Heslop ran 36.09 to win the women's race, set a pb and new TAC veterans record. It also moves Maria to 3rd on the UK all time women's list in the over 50 age group ! Full results of all three races are now on the Results 2018 page. 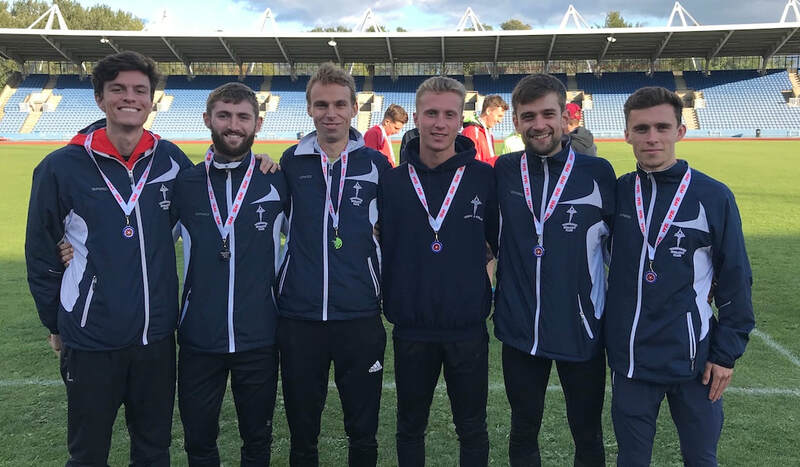 Tonbridge AC dominated with the men finishing 1st , 2nd and 3rd as the three equally selected teams matched up well. The ladies took 1st and 3rd, whilst Phoebe Barker and Ryan Driscoll recorded the fastest laps in the senior race. Ryan and Corey De'Ath moved to first and second on the TAC all time list on this course. 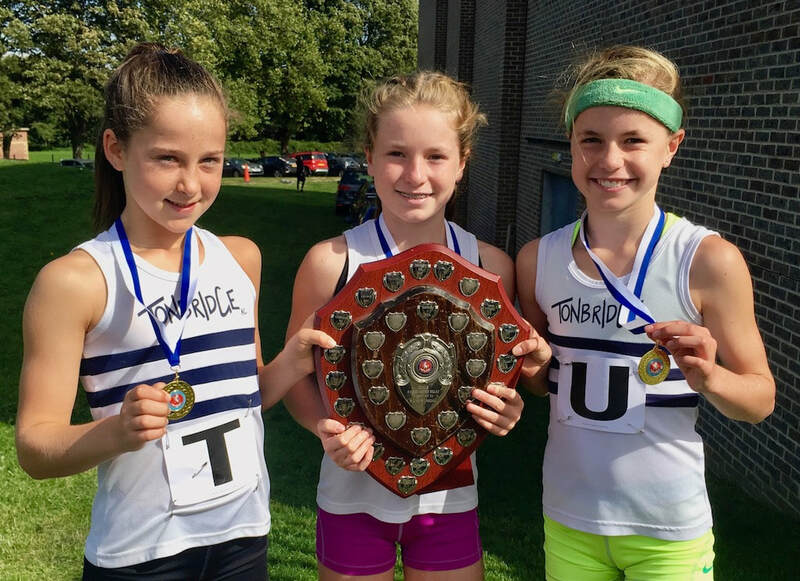 The Tonbridge u15 boys and u13 girls were first home in their categories. Matthew Taylor and Henry Taylor ran the two fastest laps, with 11.59 and 12.29. Ananjan Ganguli went off course at some stage so his time of 12.25 is not a valid one. He admitted the error straight after to officials. 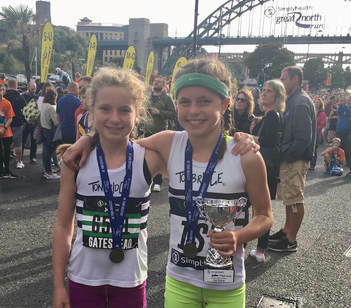 Gracie MacAuley ran the fastest u13 girls lap, with Olivia Breed just a fraction slower. Many thanks to all the runners and supporters who came along. Although it is quite a low key event many said how much they enjoyed it and its a great way of getting to see our runners in early season action. It was very impressive how everyone turned up on time, registered and got on with it. Many thanks particularly to Julie Goodge who helped organise the junior squads. I will be working on the race videos later on Sunday. Ben Cole finished 2nd in the Swindon Half Marathon, running 70.19. Ben was running for his second claim club. 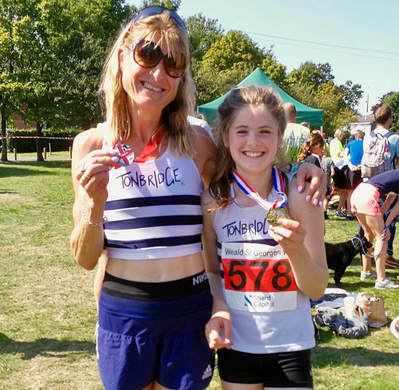 Lucy Reid was the overall winner of the Eridge 10 in 67.04, ahead of Nicole Taylor with 68.47. The women's race was dominated by TAC with Lucy Reid, Nicole Taylor and Kiri Marsh finishing 123, with Kiri 10th overall in 76.33. 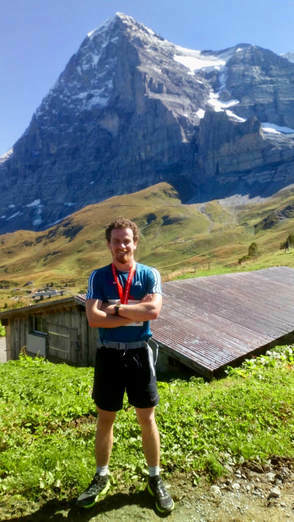 Greg Cole likes an outdoor challenge to say the least and ran the Jungfrau Marathon in 4.19.37 to place 295th. The race was one by GBs Robbie Simpson in 2.56.31. You can tell by the times that its not flat ! A nice mix of 31 runners came along to train at One Tree Hill, rating from under 13s to seniors. ​A summary is on the Training Completed page. 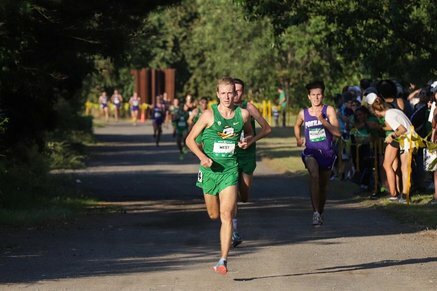 James West returned to university at Oregon, USA and within a week has won his first race back. James won the Oregon Cross Country Preview 7km Trail race in a sprint finish, recording 21.49. 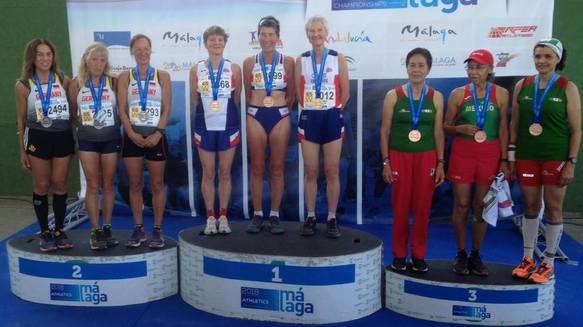 Sue James finished 8th in the over 65 womens cross country race at the World Masters Athletics championships in Malaga, Spain. Sue was in the GB scoring three that won the gold medals. 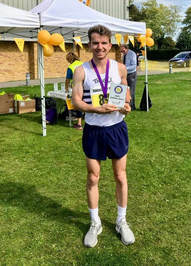 Harry Paton ran 55.00 to win the National Police Force 10 mile championship today. 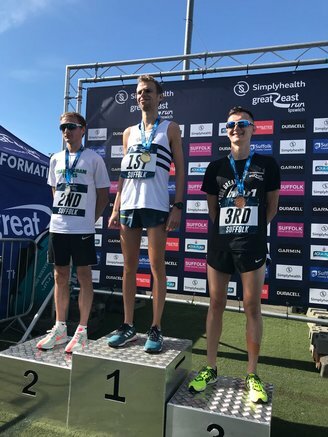 Henry Pearce set a new personal best of 29.33 when finishing 4th in the top class Cardiff 10k, on Sunday morning. Full results are here (the person showing as second, Richie Powell is an error). There were a number of TAC members in the junior 2k, with Beatrice Heslop being the first girl home. James Petrie, who is still only nine, finished second overall. 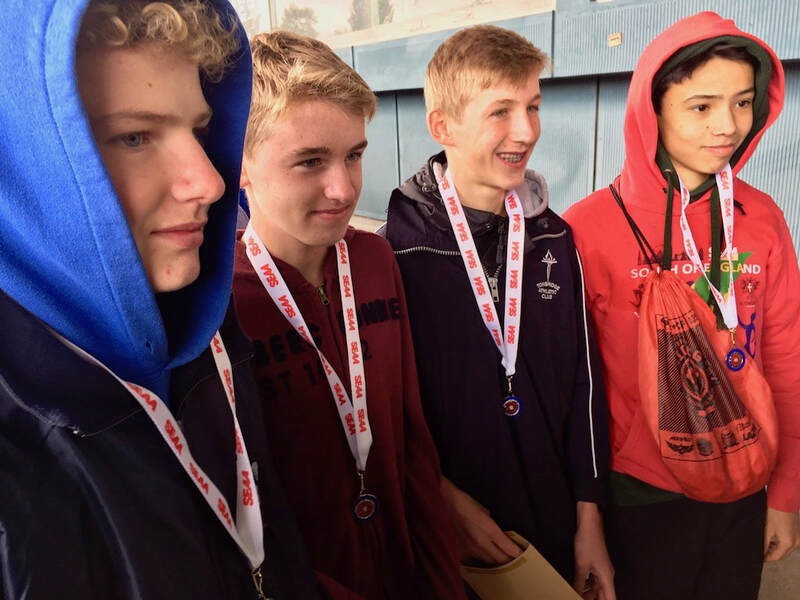 Julian Rendall notched up another 'win', whilst there was some good running from Simon Fraser, Ed Coutts (u15), Albert Kreuzberg (u13) and others not far behind. Ben Cole was first home at Swindon in 16.01, just three seconds away from his best there. 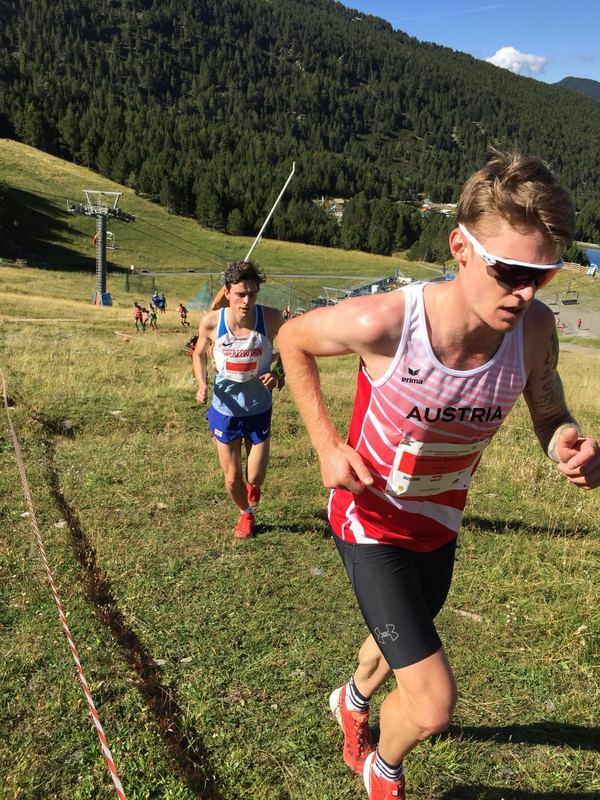 Chris Olley had a very good debut by finishing 2nd over the 8km course in 24.36. 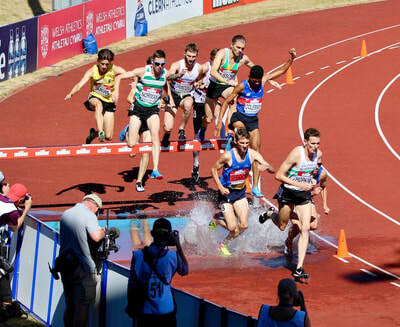 Sam Crick won the under 20 men's 2000m steeplechase in 6.16.42 and his brother Charlie qualified for the 800m final in 2.01.80, then finishing 5th in the final with 2.01.02. Results are on the Results 2018 page. 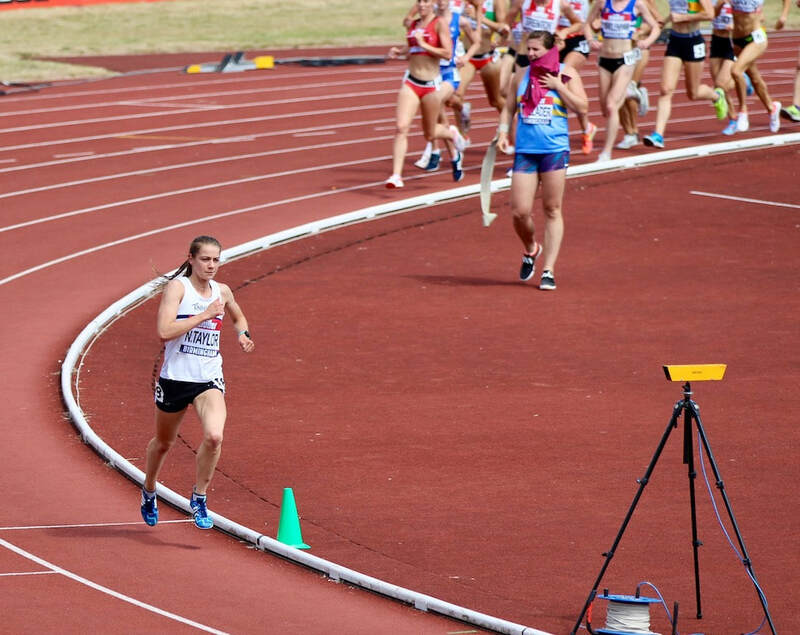 Holly Gordon (u20) ran 48.54 over 10km in her debut at the distance. There were a few TAC distance runners in action with Adam Roeder (see below) yet again extending his pb sequence at 800m. 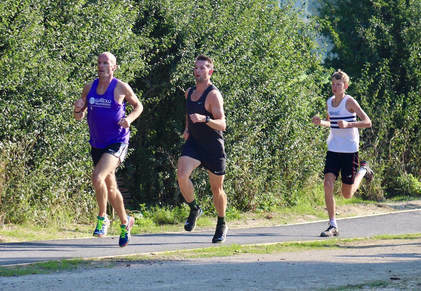 The Tonbridge parkrun continues to flourish with between five and six hundred runners this week, despite it being a Bank Holiday weekend. Dan Bradley was first home in 16.41, ahead of Julian Rendall, on a glorious morning. Adam Roeder added to his recent string of pbs by lowering his parkrun best (official times awaited), following two 800s and a 1500m last week ! 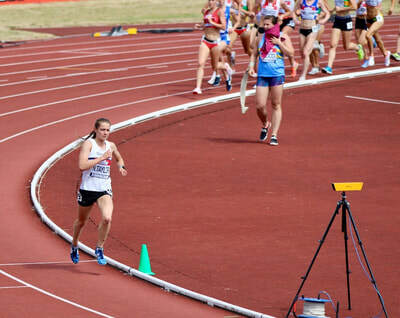 Katie Goodge was the sole TAC distance runner in action and ran in the under 17 womens 1500m final. 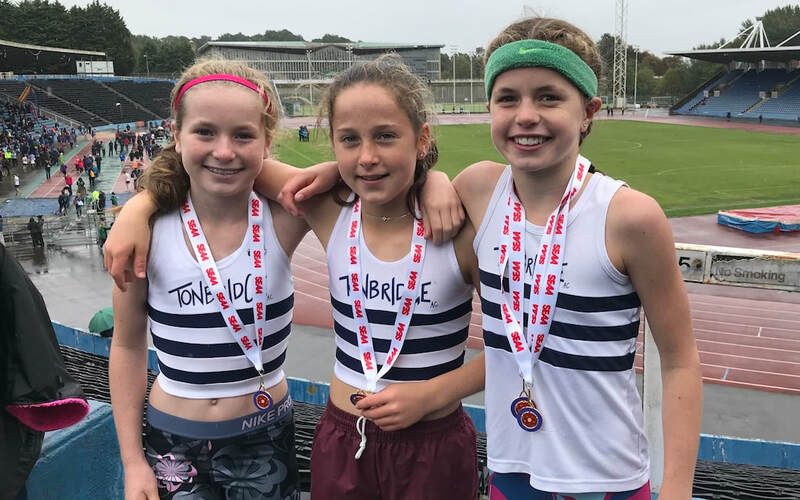 There were three TAC distance runners in action at Watford, on Wednesday evening. Dan Seagrove (u20) ran 4.09.98 for 1500m, which was a seasons best. 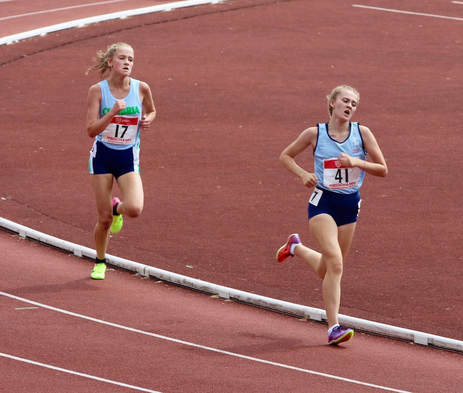 Over 3000m Kiri Marsh (senior) ran 9.57.20 (0.9s pb) and Maddie Wise (u15) ran 11.01.23 (4.2s pb). Adam Roeder (m35) has improved to 2.15.5 chipping away at it and producing 9 pbs in a row ! 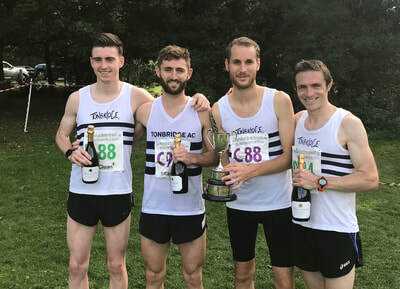 Tonbridge AC took a convincing win in the final match of the Southern League Division 2 East season. There was good support from the distance runners, with some just filling in and having a good run for the points. 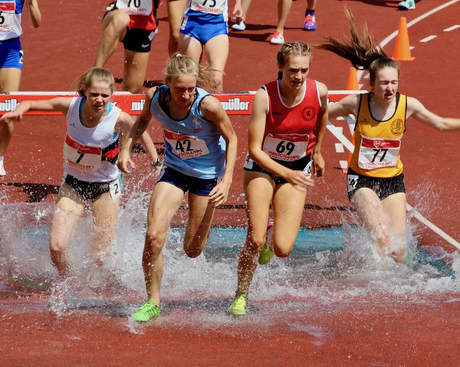 Elizabeth Heslop has taken almost a minute off her 2000m steeplechase pb in the last year. Luciana Anderson bravely cracked on in the same race, despite getting very wet ! Tom Richards finally dipped under 2 minutes for 800m. Michael Ellis (1500m and steeplechase) and Harry Paton (5k and steeplechase) put in good shifts for the team. Jamie Bryant ran 16.26 at Tunbridge Wells, which was just 14 seconds away from the course record. 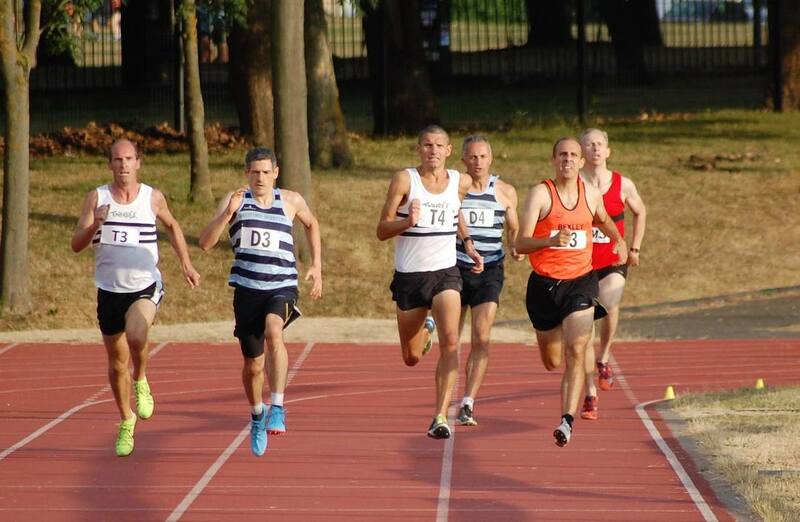 There were quite a few TAC distance runners in action at Eltham, with racing, pacing or both. 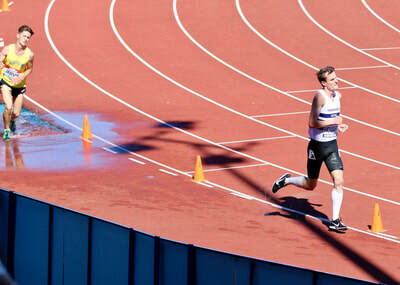 Sean Molloy finished 4th in the Sydney Wooderson Memorial 800m, running 1.49.94, in a hotly contested race. ​Other highlights included an 800m win and a new pb for Ryan Driscoll in 1.54.17, taking 0.9s from his best, whilst Cameron Payas ran a seasons best of 1.55.56 in the same race. 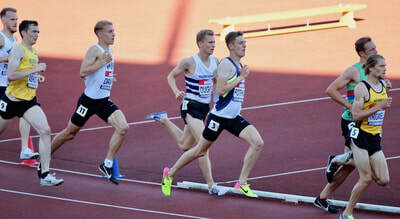 It was also good to see Dan Seagrove (u20) run a seasons best of 1.59.21, after a spell of injury, illness and exams. 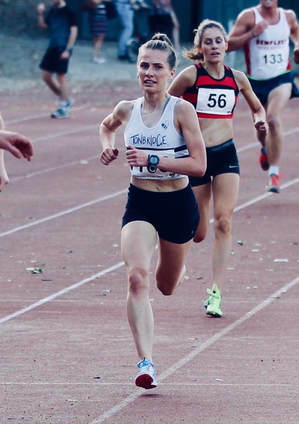 Lucy Reid ran a terrific 16.09.96 at Wimbledon on Wednesday evening to smash the Tonbridge AC women's club record, which stood to Nicole Taylor at 16.17.57, set in May. It represented a 10.8s improvement for Lucy and probably moves her into the UKs top 25 for 2018. Baby Micah Taylor arrives ! 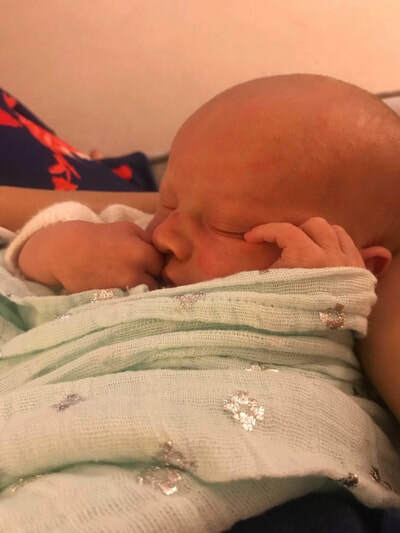 Congratulations to James (JT) and Megan Taylor on the birth of baby Micah. Tom Richards (senior) ran 2.00.5 for 800m to again just miss out on that elusive sub 2 clocking. Alice Wood was 4th female in this race, whilst on holiday in Scotland. 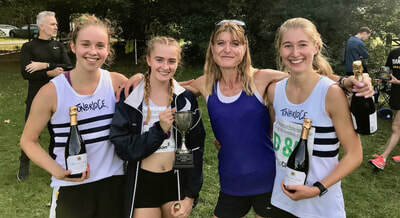 I think that Julian Rendall 17.06 and Phoebe Barker 18.00 were the fastest TAC park runners at the weekend and both of these were at Tonbridge. 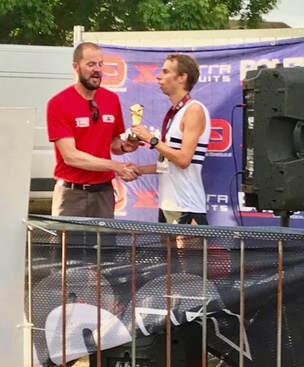 Dan Watt won this very unusual 10k race in 36.35, finishing a minute and a half clear of the runner up. So why is it 'unusual' ? Because the entire race is run on the beach ! 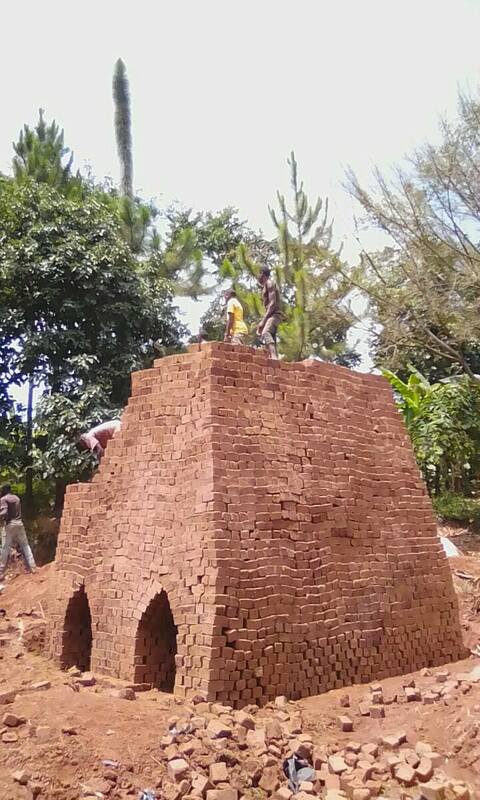 Below is a photo supplied by Dan. 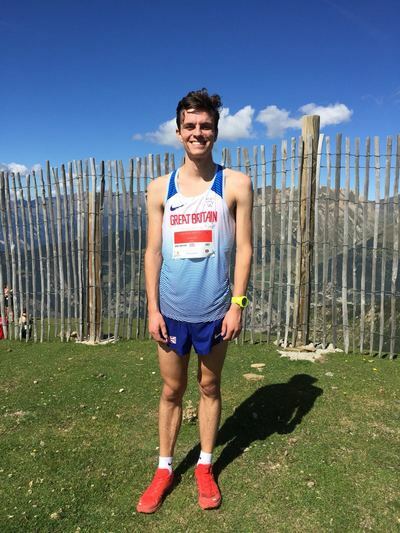 Dan Watt leads the Birth 10k on Sunday ! 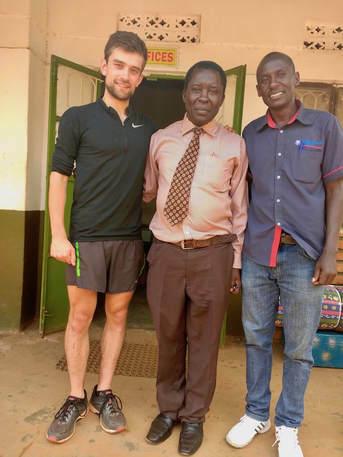 Dom Brown, who is studying medicine at Sheffield University, visited Uganda in July and experienced working in a hospital there. Coincidentally, not long before this, some of us had been introduced to a project based not far from where Dom was staying. It is a project run by Mukasa Edward, a good athlete himself, who is desperately trying to provide opportunity for poor and disadvantaged young people and develop their running and athletics. 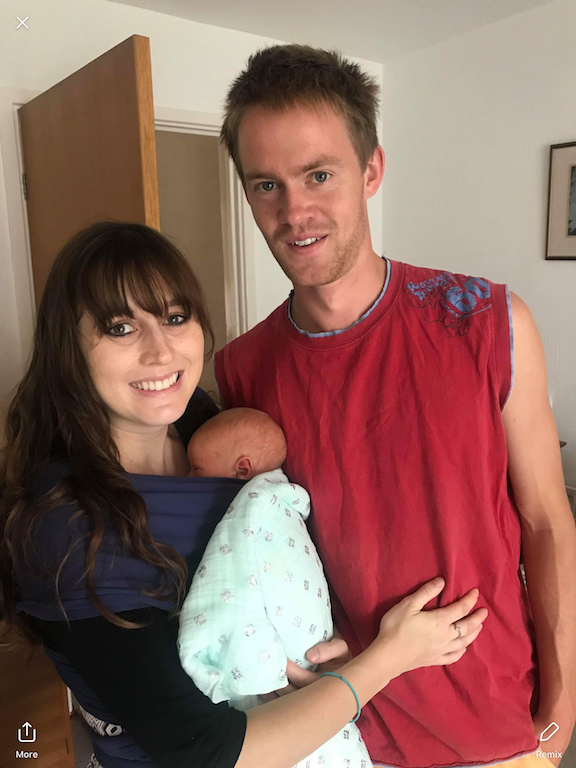 Richard Owen and Phoebe Barker visited Uganda a year or so ago and will testify how huge the disparity is between the wealthy and the poor. Personally I (Mark Hookway) collected a significant amount of second hand kit that I would like to send out to Uganda, but to date have yet to find an efficient and economical shipping method. So in the meantime I am hoping some will be willing and able to help the project by making a donation. 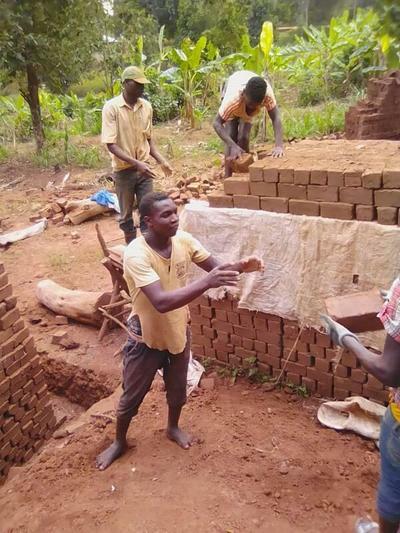 They even make their own bricks in preparation for building the accommodation ! Max Nicholls has been selected to represent Great Britain at the World Mountain Running Championships. The championships take place in Andorra on 16th September. There were four TAC distance runners in action at Watford and all had solid runs, although no pbs. ​The times were seasons bests for both Cameron and Dan. I know a few of you have been following carefully Tom Holden's progress since his accident at the end of May 2017. Introduction - On this week's show we talk to the inspirational Tom Holden. In May 2017 Tom, a GB Junior international athlete, was involved in an accident which caused damage to his brain affecting his movement and speech. Doctors thought it was unlikely Tom would walk again, but incredibly Tom has fought back- and is slowly starting to learn to run again. He speaks about how the love and support shown by his family, friends and fellow runners has kept his going. He still has a long way to go but his positivity is infectious. Dan Bradley was a 'parkrun tourist' as he finished 1st at Southsea in 16.19. Ben Reynolds (2nd claim, M50) looks like he is returning to form, running 16.46 at Abingdon. Fraser Gordon (u17) and Tina Oldershaw (w50) won the male and female categories at this 10k, as almost 200 finished. Fraser ran 36.06 and Tina 40.10, as TAC had nine of the top sixteen overall. ​Max Nicholls finished 5th in the senior mens race. A team of four is selected but there is a chance one or two who were ahead in the trial do not have the championships in their plans. ​Results are on the Results 2018 page. Provisional results are on the Results 2018 page. The Tonbridge mens team have won division 4 of the league and been promoted, after their first season in the competition. They finished second in the final match of the season, here. Results are on the Results 2018 page. Once again TAC scored heavily in the track events. George Duggan won the 800m A string in 1.53.24, with Ryan Driscoll (1.55.07) finishing 3rd in the B string race with a pb. 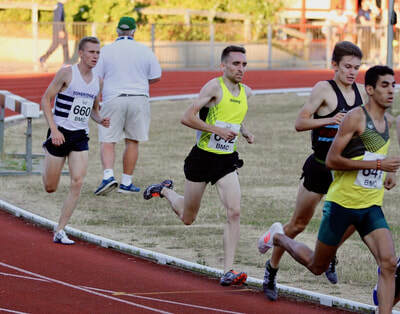 At 1500m Ally Kinloch was 2nd in the A string in 3.58.17, with Sean Molloy winning the B string in 4.02.62, just after finishing 2nd in the A string 400m with 50.06. Kieran Eland won the 400m B string in 50.89. 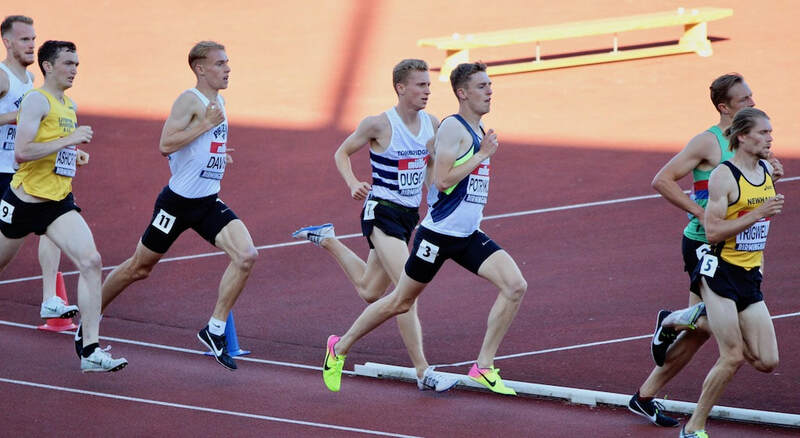 Jamie Bryant (15.06.14 pb) and Ben Cole (15.13.32) scored maximum points in the 5000 metres, as did Michael Ellis (10.16.80) and Greg Cole (10.51.22) in the 3000m steeplechase. Starting off the track events Sam Crick (3rd A in 58.13) and Tom Richards (1st B 59.20) competed over 400m hurdles with Tom going sub 60 for the first time. 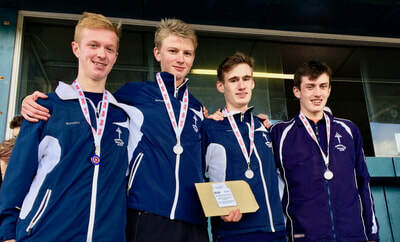 Tom Richards (52.4), Kieran Eland (51.5), Sam Crick (51.3) and Sean Molloy (48.8) were 2nd on the 4x400m relay. The good weather returned and the TAC contingent took advantage to record some terrific times. The highlight came from Nicole Taylor who lowered the TAC womens record to 9.12.41, improving it from Ashley Gibson's mark of 9.24.82, set last Summer. It was a pb from Nicole by 14.3s. A few of the vets ladies made a last minute decision to go to this tonight, Penny Pilbeam, Deniz Bowart and Kim Cross made up a team for the 10k and I was dragged to do the 5k and so made Huxley come with me. When he heard prizes were on offer he said he would run it too. We had a lovely evening and Penny came third woman in the 10k even after doing an extra 400 or so when she went the wrong way, she also came first in her age category. Deniz was 5th woman home in the 10k and Kim 6th woman home. They won the team prize for tac! Results are on nice work website or on the summer series website. Hux came 2nd in the 5k race in 20.59 which was good with those hills, and won me a bottle of wine, and then the guy from Nice Work gave him an extra fiver for himself because he felt bad he couldn’t benefit from the wine! So even though I didn’t win anything I got wine! Overall we won 6 bottles and you will see below we tried to spell TAC with them for the photo! Circuit training is cancelled for 25th July and 1st August. I am not sure that there were any more personal bests over the last few days other than this one by George. Very windy and wet conditions made it very difficult for athletes and officials, but the TAC team finished 4th of the 6 teams on the day and will remain in the division. ​Full results are on the Results 2018 page. Gary Goodge kindly filmed the races which are loaded under Race Videos Summer 2018. Sean Molloy ran 4.13.11 to finish 4th in the Soar Mile, Elite race (race 12), on Friday. Cameron Payas set a course record of 16.14 at Malling. Henry Pearce won this in an excellent 29.47. 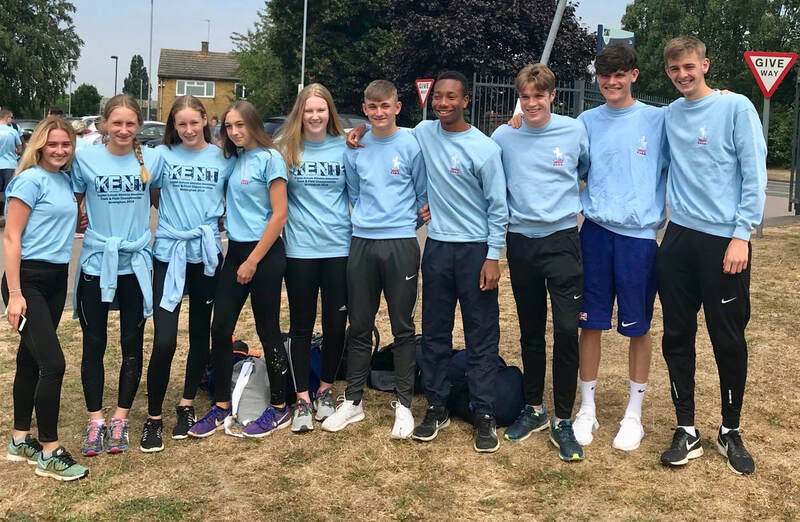 ​There were a few TAC athletes in action including Albert Kreuzberg, George Hopkins, Lily Slack and Sophie Slack. Mark Hookway was one of the three invited speakers at the first ever UK Endurance Conference. 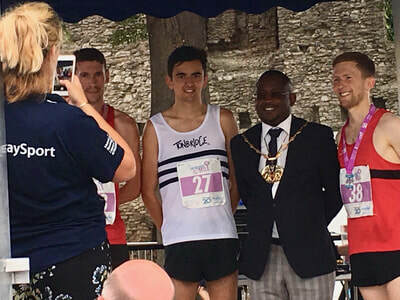 Mark spoke about the rise of Tonbridge AC and was accompanied by two other speakers. 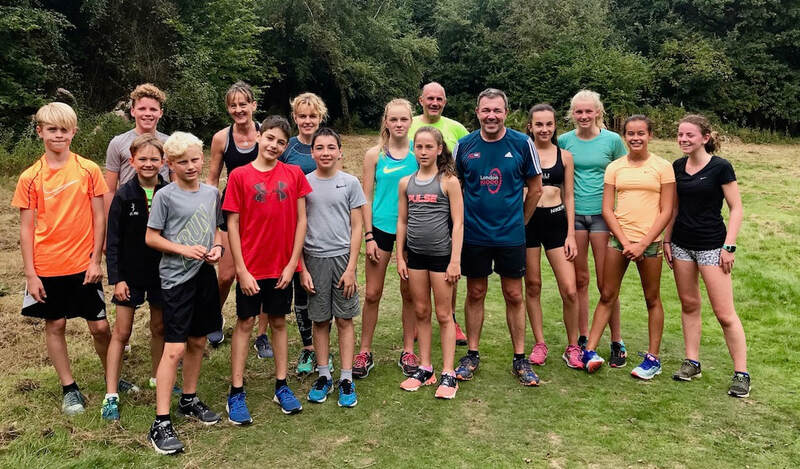 Richard Partridge, a former international himself and father of current marathon runner Lily Partridge, talked about training for endurance events and cross country. 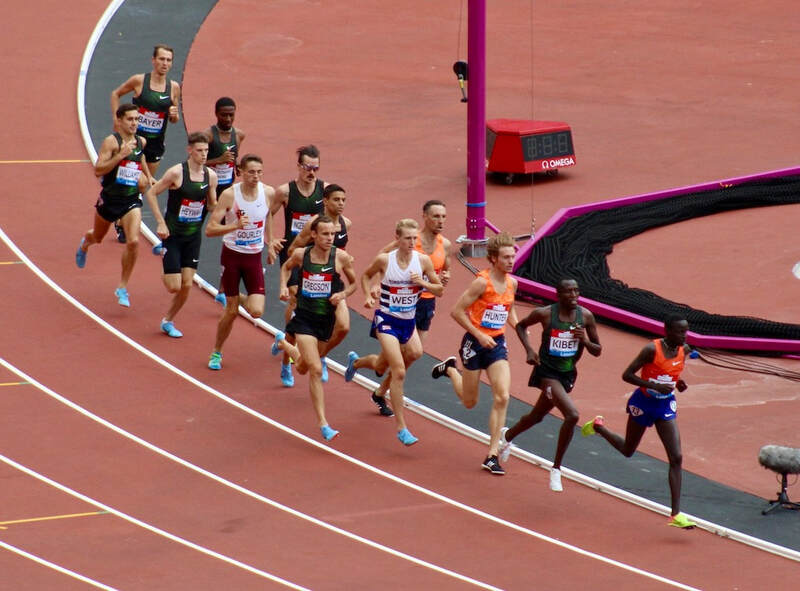 Eamonn Martin, a former winner of the London Marathon, spoke about his views on the decline of elite marathon running in the UK and aspects that could be put in place to resurrect it. Videos loaded from Watford ! George Duggan ran a big new pb for 3000m of 8.14.95 and Ryan Driscoll ran 8.18.03 in the Elite mens 3000m invitation race. 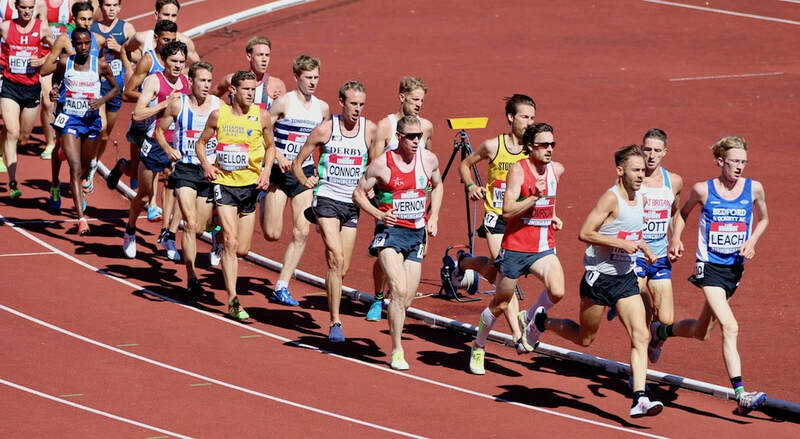 This turned out to be one of the best 3000m races ever in the UK with eleven Brits running under 8 minutes. 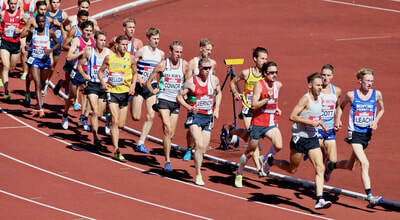 ​Toby Emm ran 4.16.9 for 1500m, although the official result is awaited. Here are a few who have set personal bests over the last few days. 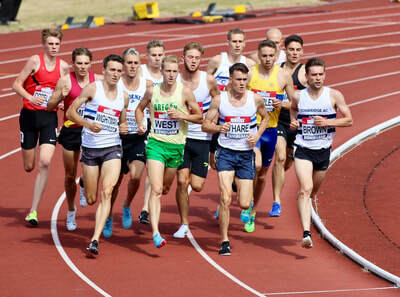 James West ran a superb race at the Anniversary Games to finish 10th of 16 in a world class 1500m field. James ran a new personal best of 3.36.59, which is not far away from Andy Graffin's club record of 3.35.97. His time improved his best by 0.9 seconds and ranks him 6th on the UK list for 2018. ​It moves James to 38th on the UK all time list and 12th on the UK all time under 23 list. ​I thought that it might be worth writing a little bit more about James performance, as I am sure some would be interested. Its been a few years since another TAC athlete reached this level at 1500 metres. 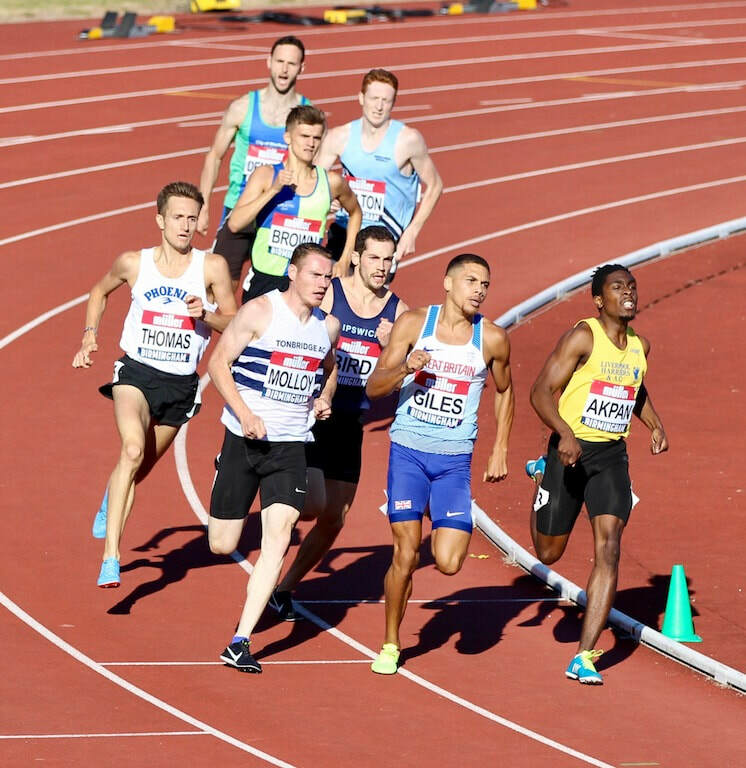 His time was the second occasion this year that he had run inside the European Championships qualifying standard, of 3.37.50, although unfortunately the event is so strong in GB that he won’t be selected amongst the three that will go. His 1500m time is now 6th on the UK 2018 rankings and 38th all time (Farah, Cram, Coe and Ovett are the top 4). He is ranked 12th on the UK all time under 23 list, which is headed by Steve Cram’s 3.33.66. This is a key point, as the comparison of the u23 list to the overall list shows that many of the GB top 1500m of all time progressed into their mid and late 20s. In other words there is every chance of developing further, beyond university, as many are still getting stronger physically. Remaining patient, consistent and hopefully injury free all play a big part. Without embarrassing James too much I feel there are a few attributes that have helped him to get where he is. He is very focussed on what he is doing week in and week out with training ie he gets on with it, gets it done and rarely ever finds an excuse not to. He has generally (touch wood) had a good mix of training and avoided injuries. Then perhaps one attribute that particularly stands out is his attitude to adversity and set backs. He has had a few, as everyone does in their careers. Back in the Autumn he had some real disasters at cross country but maintained a determination that the training would pay off and he was getting stronger. Then came the Summer and in the USA College system they have Conference, Regional and then National Championships. James would have been one of the favourites to make the National final but had a disastrous run in the Regional qualifiers and was eliminated very early in the process. Many would have felt sorry for themselves and even called it a day on their season, despite it only being June. He didn’t do this, ran a couple of more solid races in the States and then came home to the UK for the Summer. Again many don’t even try to prolong their season, when USA based, but James has, even running the 3000/800 double at the British League fixture, for Tonbridge, prior to this race at the weekend. A) You don’t have to be the best in the younger age groups to get to the highest level as a senior, even at under 17. B) Patience, consistency and a long term view can really help. C) How you react to adversity is often the biggest factor that divides the top athletes and others. Hope that this is useful to some. 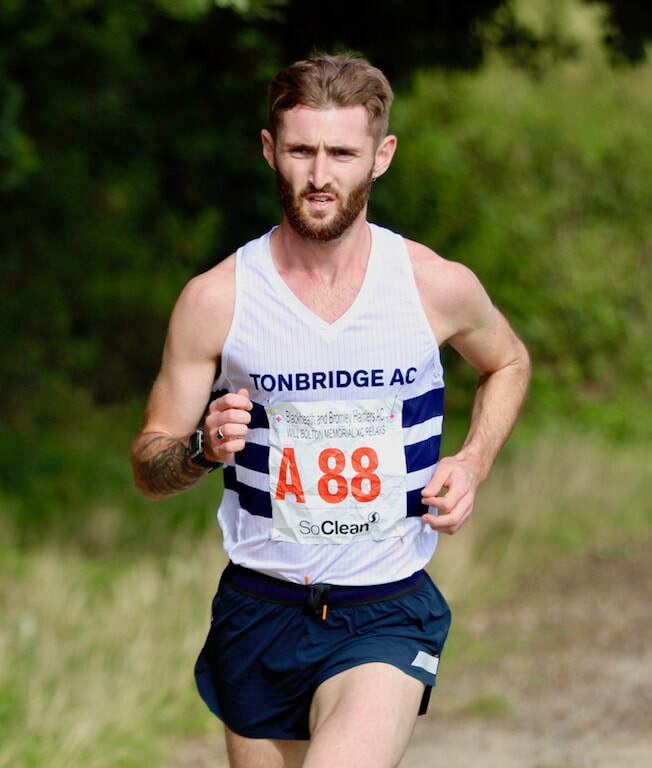 Tony Bennett was the only TAC athlete in action and finished an excellent 4th in 36.37, which is certainly his best time as a veteran and may well be an outright pb, as it's 1.53 quicker than his listed best. 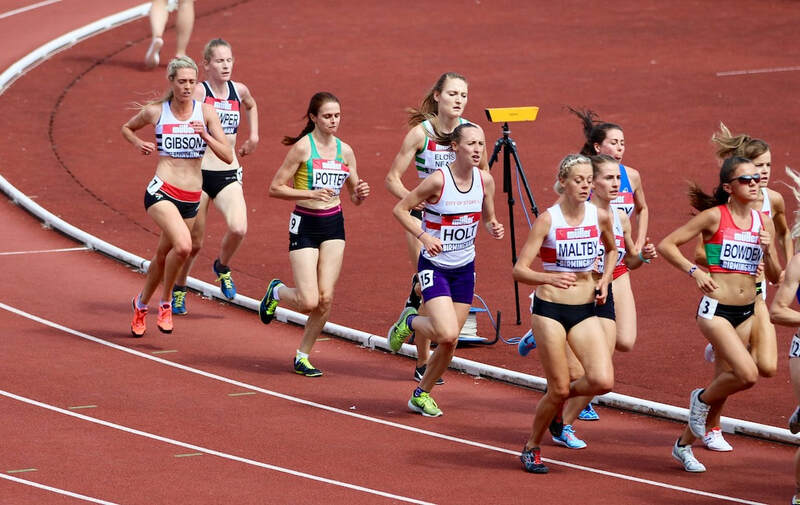 Katie Goodge representing England finished 5th in the Inter Girls 3000m in 10.19.90. 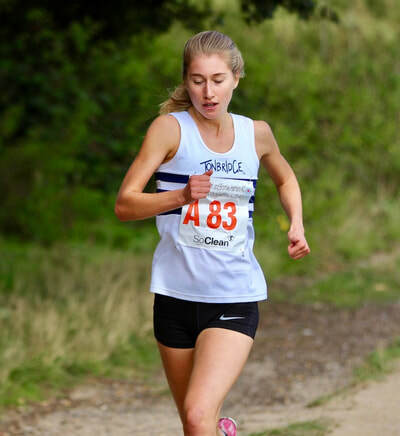 Nicole Taylor lowered the womens record at the Royal Tunbridge Wells parkrun to 17.48 from the previous 18.51, set in April 2015 by Alice Heather-Hayes. 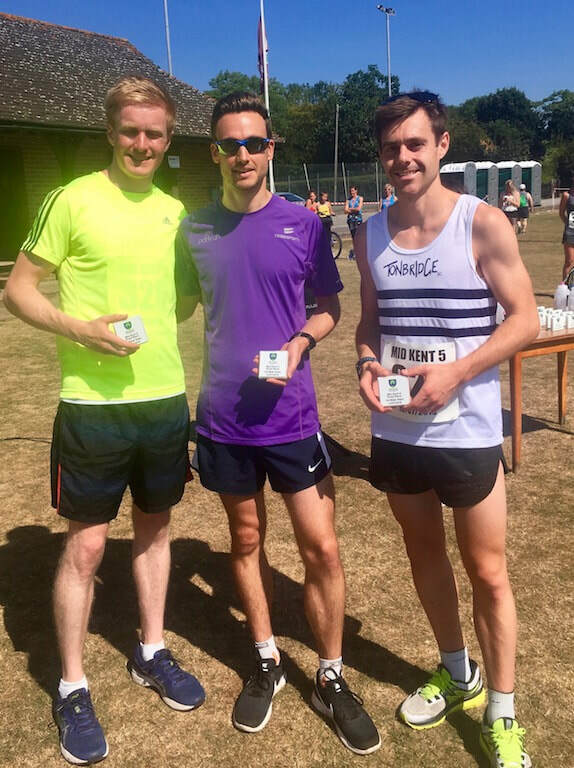 There were 'wins' for Fraser Gordon (Tonbridge) and James Taylor (Lullingstone), plus an excellent 15.47 pb from Dan Schofield at Bromley. 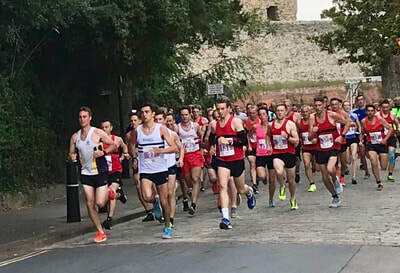 Cameron Payas won the Medway Road Mile, at Rochester, on Friday evening in 4.37. There was a new personal best of 2.00.02 for Tom Richards as he continues his attempt to break two minutes for 800m this year. Also Kieran Eland and Cameron Payas ran seasons bests. A results summary is on the Results 2018 page. 400m Charlie Crick (u20) ran an official pb of 51.45, although he has gone quicker in school races. 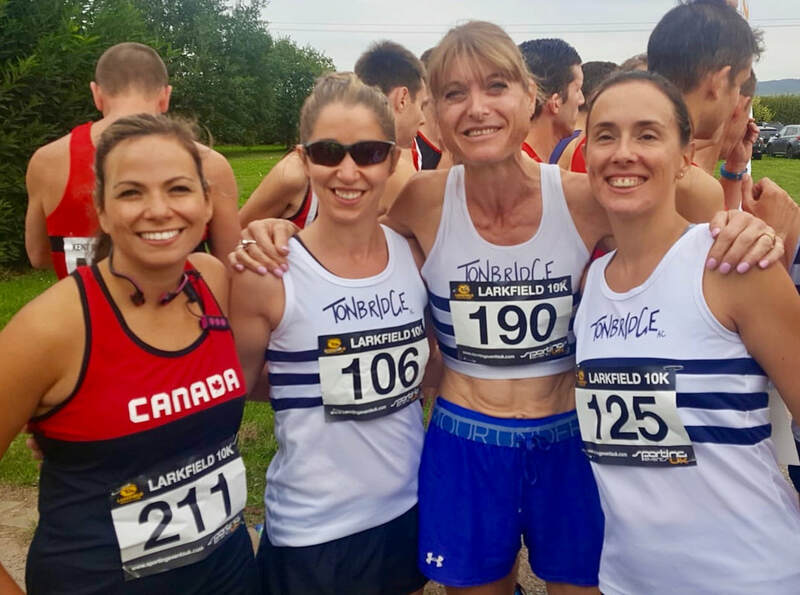 Lucy Reid won her second city 5km race a week after her last. Her time was 16.41. Harry Paton finished 9th overall in 15.58. Graeme Saker (m55), on a trip to the West Country, finished 10th in 17.54. The TAC over 35s (and beyond) teams dominated the Kent Divisions of the Southern League, as the men and women both finished as division 1 (top division) winners and the women’s B team won division 2 ! The final match of the league season was on Monday night and now the men and women go to the league finals in September. Note - Noémie has had 5 races at the event this year and set a pb every time ! In very hot conditions there were three really good performances near the front of the race, that helped win the team race. TAC won the match and full results are on the Results 2018 page. Inter Girls 3000m - Katie Goodge 2nd 10.02.42 pb by 6.7s. 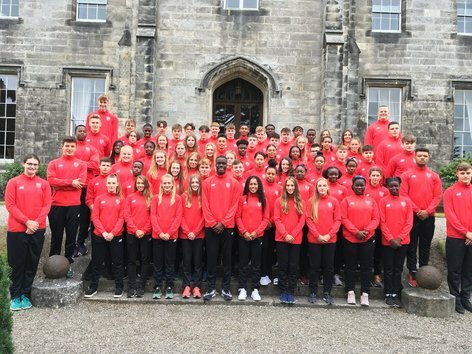 Katie selected for the England team at the home international. TAC had two runners in the BMC races. Ben Murphy ran 1.53.68 for 5th in the 800m B race and George Duggan ran 3.44.90 for 10th in the 1500m A race. George's time was a seasons best and just 0.02s outside his pb. With the hot weather its been tough to get pbs in the longer events, but here are two that have succeeded over the past week. 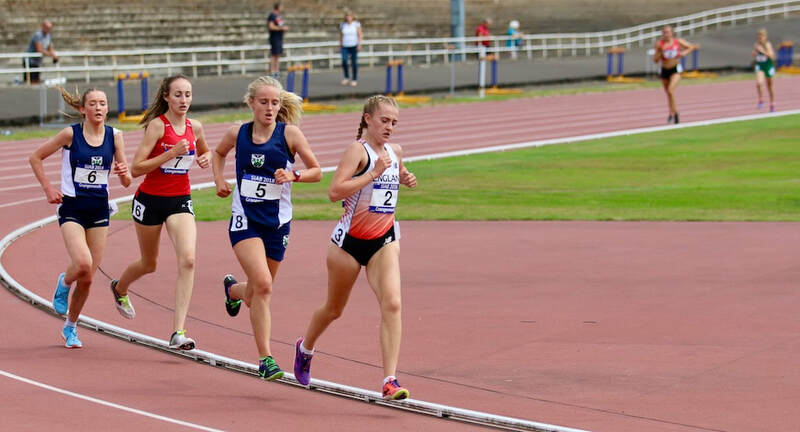 Katie Goodge continued her fine recent form by winning the girls 1500m in 4.43.31, whilst James Kingston was third in the Boys 3000m. Results are on the Results 2018 page. Tonbridge had a terrific win in the third match, of the Division 4 British League match. On this occasion the league held all five divisional matches at the same location, at the same venue. Great credit goes to the organisers and officials for helping it go so well. 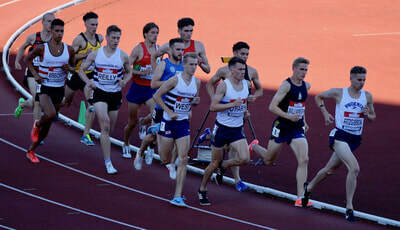 James West completed a tough triple as he won the 3000m in 8.11.69, a race that was combined with division 3. James' time set a new Division 4 record, whilst Jamie Bryant won the B string with a new pb of 8.38.68. Not long after the 3000m James won the 800m A string in 1.55.60, whilst Kieran Eland won the B string in 1.57.54. James combined with Kieran, Sean Molloy and Tom Richards to win the 4x400m at the end of the day. 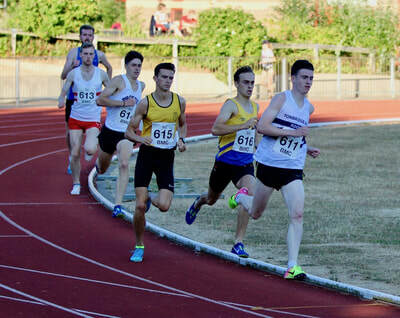 Sean won the 1500m in 3.55.65, covering the final 700m in about 1.45, whilst Cameron Payas won the B string in 4.07.69. 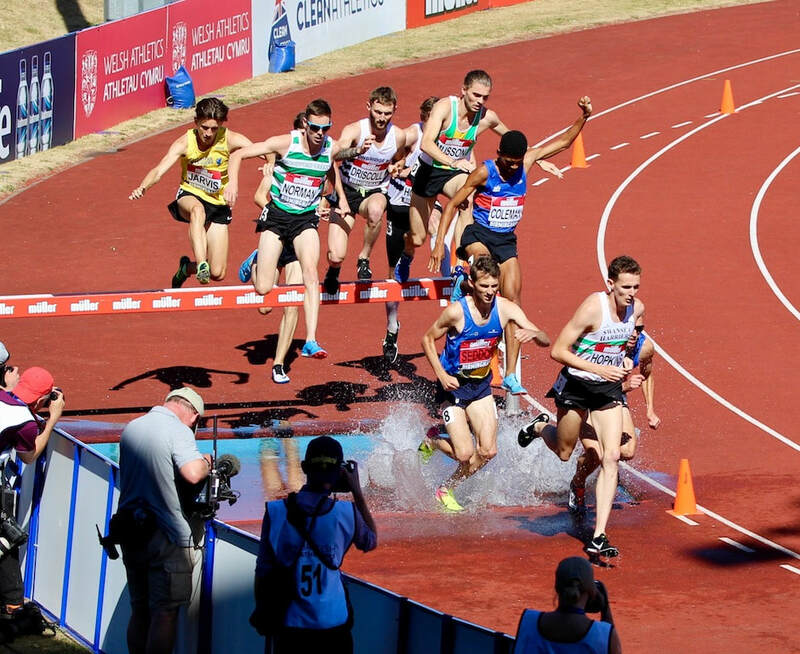 The official 3000m steeplechase results are still to be confirmed but Jamie Bryant ran 9.54.40 and Michael Ellis 10.21.80. Here are some of the biggest improvers over the past couple of weeks. TAC teams were 1st men division 1, women 2nd division 1 and women 1st division 2. Julian Rendall finished 3rd in 34.36 and Maria Heslop was 1st women in 37.35 (7th overall). 1500m men heats - James West 2nd heat 3 3.44.49 (qualified), George Duggan 7th heat 2 3.49.54, Kieran Reilly 10th heat 3 3.55.40, Dom Brown did not finish heat 2, but advanced to final as an advertising hoarding blew into his way !